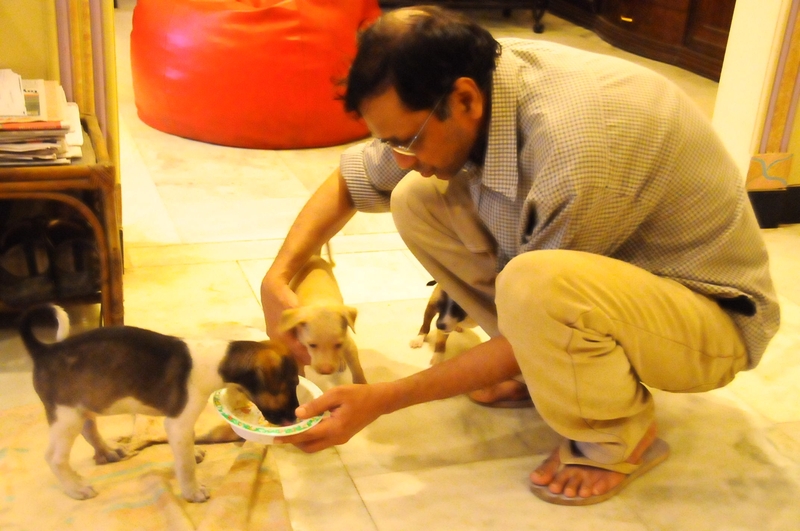 As recommended by Madhu Ma’am, here are the pictures of the puppies. All of them are males. Pictures are not included for 3 of them- out of those 1 is completely white and 2 are completely black. Please feel free to contact me in case of queries, or pass on my number. Also, I’m ready to support the owner with medical supplies, food supplies, etc. 9 8 1 8 0 7 8 3 9 2. Above – ‘Beagu’ after a meal ! Above – ‘Motu’ Getting Ready to Take Off ! 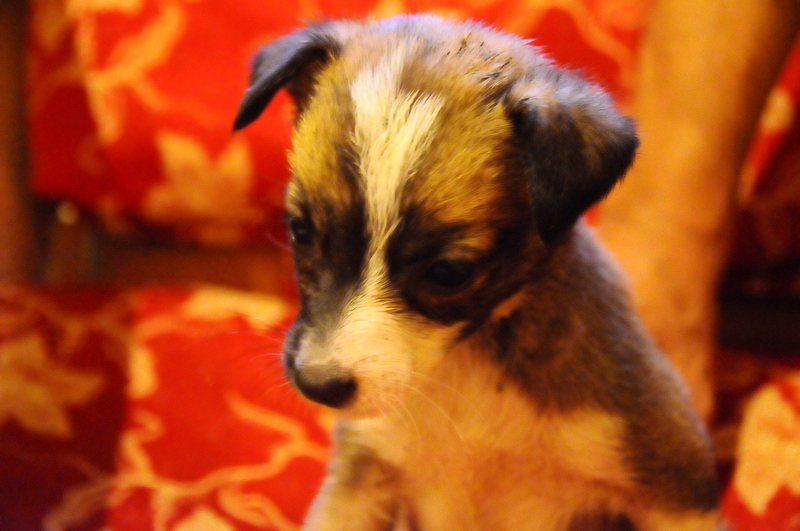 There is a litter of 7 pups in my area- all very healthy, cute and extremely adorable! My family has been fostering them since 1 month. As of now they are 2 months old. I have been trying to find good homes for them. Please help me to find good homes. 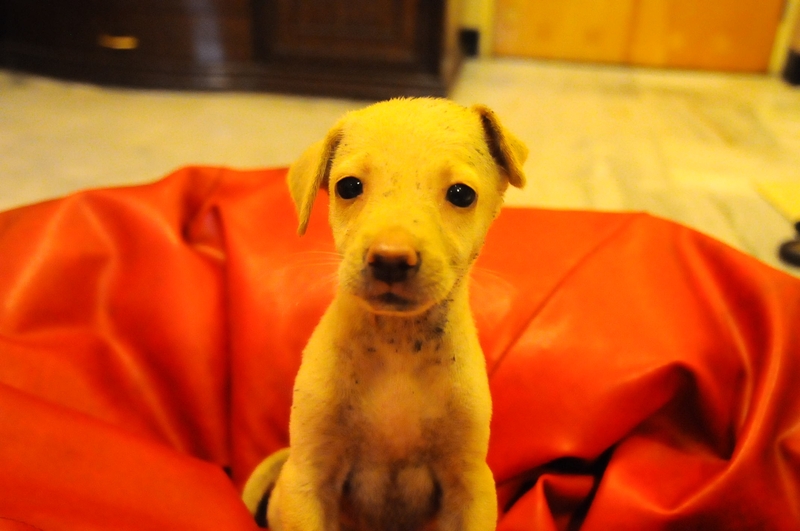 I’m desperately in need of homes- people who would not only be willing to adopt, but also take good care. I’m also willing to support them for a year (food expenses, medical expenses, etc.). It doesn’t matter if its your friend or gardener or driver or even your maid! What I’m looking out for is people who are willing to care for the pup and love it unconditionally. Alternately, I would be happy if you guys can share addresses of Kennels (IDA, etc.) in and around Mumbai (preferably). I am willing to support them with the necessary resources (monetary + kind). My concern is to get find a good place for these pups as they’ve started coming out on the street and might get run down by passing vehicles, which is very frequent in our area. We first found Kira and Big Mama nine months ago, and started preparations for the flight three weeks ago. Finally, all the hard work paid off as Kira and Big Mama are finally in a sanctuary. It was hard enough to secure their freedom from the zoo, but finding a suitable sanctuary – and all the help and donations needed to get the bears there – took just as much effort. With the help of groups around the world, we were able to contact Dr. Nilufer Aytug of the Karakabey bear sanctuary in Turkey and secure a lifelong place for them there. As bears are endangered animals, we had to get special permits to be able to transport them internationally. We received the permits at the last minute, and went to the airport in the middle of the night to pick up the team from the sanctuary. Dr. Nilufer, a bear expert, arrived with Dr. Huseyin Cihan, another vet from the sanctuary, and Ms. Natasha Wothke of German group Pro Animale. Pro Animale is a major supporter of the sanctuary and covered a majority of the expenses needed to get Kira and Big Mama there. Early the next morning we finished off the specialized crates needed to fly the bears, and left for the zoo in the late afternoon. We considered trying to coax the bears into the transport cages but decided it would be safer to quickly anesthetize them and place the bears in the waiting crates. Kira was first, and in less than 15 minutes the medications had taken affect and we were able to break the rusted locks and carry her from the cage. Big Mama, much heavier, needed eight people to carry her out and place her safely in the crate. Just as it was getting dark the crates were loaded into air conditioned truck to be driven to the Beirut airport. It was so strange to us that after having been locked there for 15 years they were freed in just minutes. We had to be to the airport at midnight as their flight was at 4 am, and from previous rescues we knew showing up with two bears would bring a lot of attention and we had better be there early to get all the paperwork in place and see the bears loaded in time. MEA had offered to fly the bears for free, but unfortunately their planes which went to Turkey for the next couple weeks were not big enough to safely accommodate the bears so we had to keep searching for an airline to fly them. Emirates agreed to fly them from Beirut to Turkey via Dubai, and sponsored 40% of the cost. Jean Kreiker of Emirates SkyCargo helped make sure all of the paperwork was in order in the days leading up to the flight, and he was kind enough meet us at midnight to help make sure everything went smoothly even though he was not scheduled to work. Kira and Big Mama had became fully awake by then, and they seemed as surprised as we were that they were finally out of the zoo. After a few last treats and some water, we said our goodbyes as the crates were driven away to be loaded on the plane. In Dubai some caring volunteers were able to make sure they were fine at the airport and gave them each some water and to see them on the next part of their trip. Dr. Huseyin called us the next afternoon to say they had arrived safely to Turkey and were on their way to the sanctuary. Kira and Big Mama arrived to the sanctuary that night and were released into a temporary quarantine enclosure. Big Mama ran straight out of her crate and climbed into the pool. Kira has already started to make friends with some of the 50 other bears at the sanctuary as they watch each other through the fence. In a couple weeks, after they have had a chance to settle in, they will be introduced to other bears and finally get to enjoy the large forest waiting for them. Thank you to Emirates and MEA, all of the organizations and individuals who helped along the way, the Animals Lebanon supporters who helped make this possible, and especially to the Karakabey sanctuary for giving Kira and Big Mama their first opportunity to be bears. Stay tuned as we travel to Turkey to be there when Kira and Big Mama are released into the forested enclosure! Our team in Indonesia is making real progress rescuing primates from the pet markets. Now they have uncovered another shocking situation which they cannot ignore – in West Kalimantan (Indonesian Borneo) a number of orangutans are being kept in terrible squalor, chained up on pallets over open sewers choked with human waste. 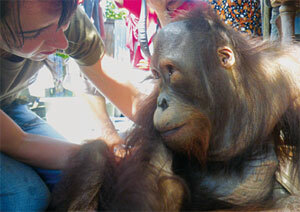 Charlie is one of these orangutans, a gentle giant bent and arthritic from years crouching on the end of a short chain. Our vet Karmele was asked to treat his sores but was devastated at having to put the shackle back on his arm and leave him in his misery. He is still there now, weak and starving, patiently waiting for us to help him. We have found nearly 20 others like Charlie that have been caught during the destruction of the rainforest and are living in hellholes in the backstreets of Indonesia. To put it plainly, if we don’t help these poor animals, no one will. But with your support our team can act immediately to bring them food and medicine and set the wheels in motion to create a new home for them before it is too late. There is no other team working in West Kalimantan to help orangutans. This small group of helpless animals has gone unnoticed by rescuers working elsewhere in Borneo. We simply have to help them. Please, if you possibly can, make a donation today, indicating that you want it to support ‘Primates’. We will use your gift as swiftly and as effectively as possible to help these forgotten animals. And we will let you know the fate of Charlie and his friends. If you have already responded to my appeal for the orangutans in the post, thank you very much for your kind support. The head office of International Animal Rescue is in Uckfield, East Sussex in the UK. We help marine wildlife in distress by providing an office and full administrative service for British Divers Marine Life Rescue.Through Catastrophes Cat Rescue in Sussex, IAR gives sanctuary to abandoned and unwanted cats and also conducts sterilisation and vaccination trips in Europe where there is a need to stabilise populations of feral cats and prevent the spread of disease. IAR’s US office is run by Laurence Van Atten from Shrewsbury, Massachusetts. Laurence organises lectures and fundraising events to raise awareness of IAR’s efforts. 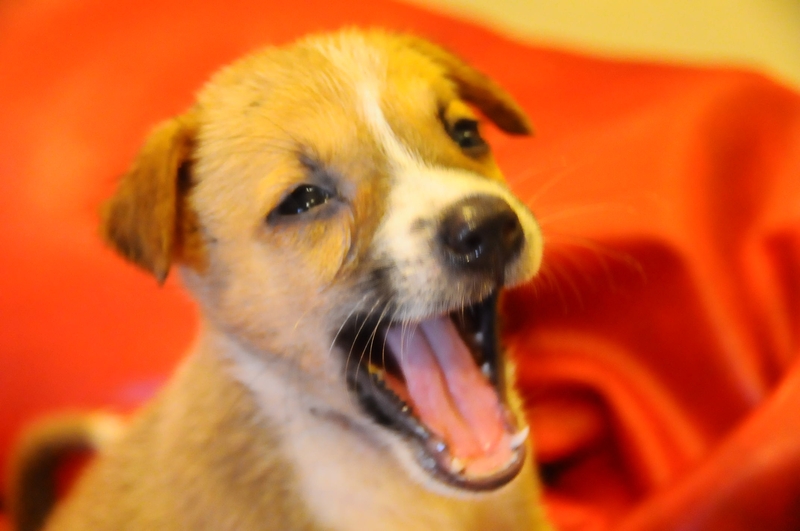 IAR has veterinary clinics in Goa and Tamil Nadu. Our clinics sterilise cats and dogs and are registered with the Government of India under their Animal Birth Control (ABC) Scheme. We are also closely involved in the campaign to remove the dancing bears from the streets of India and we are the sole UK funder of bear sanctuaries in Agra in the north and Bannerghatta in the south of India. Our Indonesian team focuses on the rescue and rehabilitation of captive primates, particularly macaque monkeys and slow lorises. Max Farrugia, Chairman of IAR Malta, runs a bird rehabilitation hospital in Valleta. Species that he has nursed back to health after shooting injuries have included honey buzzards, hobbies, kestrels and short eared owls. When they have recovered, rescued birds are released back into the wild. Many animals suffer prolonged, painful deaths when they are injured but not killed by hunters. Hunting disrupts migration and hibernation patterns and destroys families. For animals like wolves, who mate for life and live in close-knit family units, hunting can devastate entire communities. The stress that hunted animals suffer—caused by fear and the inescapable loud noises and other commotion that hunters create—also severely compromises their normal eating habits, making it hard for them to store the fat and energy that they need in order to survive the winter. OIPA received a desperate alert from “Heart for the Animals”, a local organization, about the dreadful situation of stray dogs in Skopje (Macedonia). There is one only shelter over there, where dogs are killed in huge number and impressive frequency. The Mayor, responsible of the shelter, declared openly that dogs must be killed, everyone of them. Volounteers protested, of course, but it’s been vain. The shelter was meant to sterilize dogs and then let them go, but OFFICIALLY 56% of dogs are killed. The situation for cats and dogs – stray and owned – in Belarus is desperate. In the country there are not Municipal shelters. The only way used to control the stray animals over population is the killing. Every year, across the country, about 70.000 animals are killed. In Minsk, with the tax money, it was built a temporary shelter for cats and dogs. It is the only one in the country, its name is “The fauna of the city”, and there all the stray animals are taken after the capture. The living conditions are horrible: cold, few food, illness and the animals are abused. Animal rights people in Santa Catarina, a state in southern Brazil, report another case of abuse and ill-treatment of animals. This time, the victims are the horses, used for a regional competition called “Puxada de Cavalos”, that consists in using horses to draw a load that weigh about 2 tons. A wonderful news for the animals from Physicians Committee for Responsible Medicine. Independence Day came early this year for pigs in Alabama. Just four days after PCRM wrote to ask the University of South Alabama to stop killing pigs in its trauma training course, the university contacted PCRM to learn about superior nonanimal training methods. In the latest course, instructors used the TraumaMan System instead of live pigs. The tens of millions of animals who are burned, electrocuted, and addicted to drugs in laboratories each year in the name of science need your help. 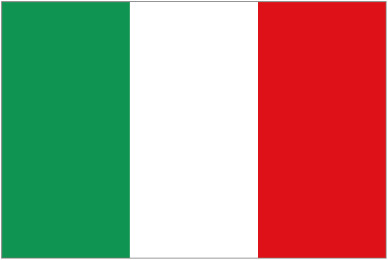 Single associations, one or more for each country from every country, can be admitted to the Organization as joining associations. These are called “member leagues”. 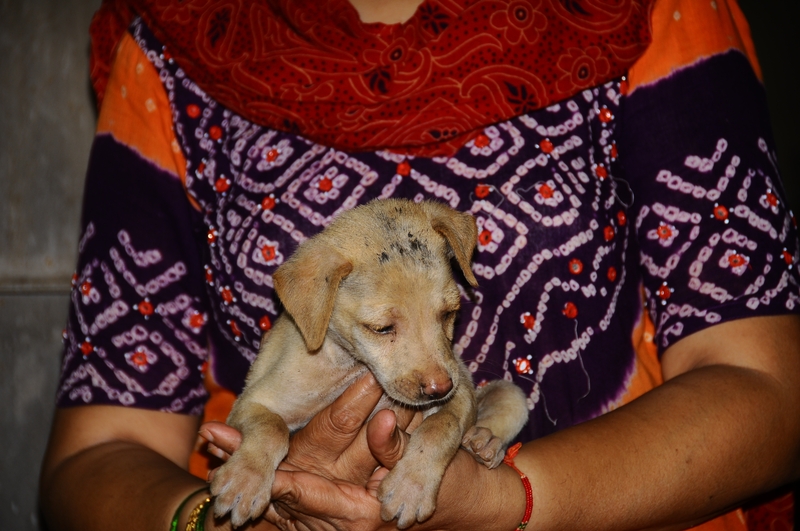 We need your financial support in order to put a stop to animal cruelty. 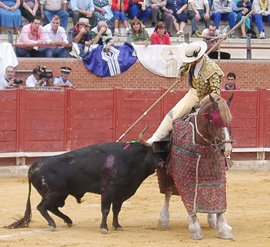 Uk: League Against Cruel Sports – Help Them Take Action Against Bullfighting in Spain! Take action against bullfighting in Spain! Every year in September the Toro de la Vega, one of the cruellest bullfighting competitions, takes place in Tordesillas in Valladolid, central Spain. The bull is forced to cross a bridge by villagers taunting and teasing it with spears. Once it has crossed, men with lances either on horseback or on foot, aim shots with lances at the bull. Finally, after hours of agony, the man that throws the fatal blow wins. As if this spectacle was not grotesque enough, the “winner” parades through town with the testicles or tail of the bull on his lance as a trophy. Click here to email the interior minister of Castile and Leon, Alfonso Fernández Mañueco, and urge him to revoke the license for the event. We need your support to stop this event. We need you to help us make bullfighting history! QUEEN guitarist Brian May has agreed to be the patron of a new anti-hunting group based in North Wales. The group, Wales Against Animal Cruelty, was set up earlier this year by Rhyl activist Judi Hewitt to fight Tory plans to repeal the ban on hunting with dogs. “I’m delighted that such a high-profile celebrity has agreed to Šlend his name in support of Šthe work I do,” said Judi. “My campaign against the Tories is going really well and I’ve now delivered in excess of 2,600 leaflets. Brian May agreed to lend his name to the campaign after learning of new Countryside Alliance plans, unveiled this week, to license hunts. The Tory-backed strategy includes a new Hunt Regulatory Authority (HRA) to police hunts. Every hunt would have to sign up to the HRA, under which entire hunts could be banned and packs of hounds de-registered – though this ultimate sanction is unlikely. Under the plan, all hunting would be governed by six rules, including a requirement to avoid “unnecessary suffering” and to respect landowners. 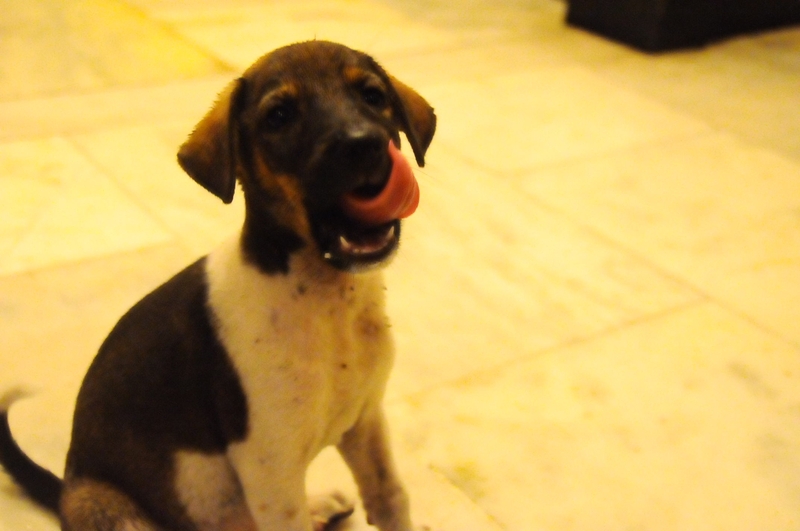 1. a couple of 6 month old mixed breed pups for adoption with me. efforts may fail, but do not fail to make an effort! Animals and humans suffer and die alike. …the same pain, the same spilling of blood, the same stench of death, the same arrogant, cruel, and brutal taking of life. 30th August 09 at 9.00 am at the ALBERT HALL MUSEUM entrance. We are sure you will be there to support the cause against cruelty to elephants. Look forward to seeing you with your family and friends. Maina, Jaipur’s 30 yr old elephant died on 24th August 2009. It’s high time we gear up and do something for our jumbo friends. Come join our elephant march and be a part of Maina’s funeral!! Let’s make sure we put a ban on the iron ankush, limit the number of rides per elephant in the scorching heat at Amer fort, and treat animals with love and care. Bring along friends and family! Citizens March in collaboration with Help in Suffering, Jaipur.